The Man of Steel trailer was finally released by Warner Brothers and I don't know about you, but it brought a tear to my eye. In the trailer we get to see the context of the above pic and besides not having red trunks, Superman also has no yellow "S" on his cape. I've heard a mixed bag from those who either think the movie is going to be horrible or that it's going to soar. For me and from what I have seen, I have high hopes. Especially, after what Christopher Nolan did with Batman. Nolan is alright in my book and I have faith this is going to be awesome. What does everyone else think? 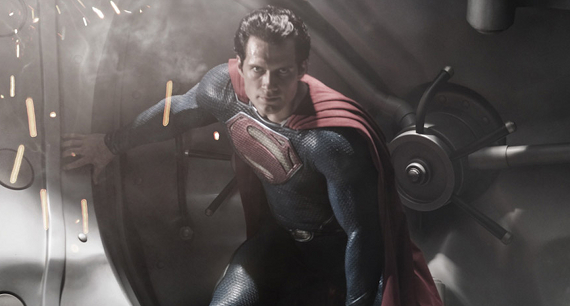 Has this latest trailer turned you on or off from the latest incarnation of the Man of Steel. I'm optimistic. I'm not a big fan of the new costume, but aside from that everything in the trailer looks pretty good to me. I am not bugged by the lack of red trunks, but the missing yellow "S" from the cape is somewhat bothersome for me. My son was watching over my shoulder and asked "Is this a beginning one? "...I said yes and he asked "Didn't they already do a beginning one?" I think that is my mindset...I SO want to love this but I am conflicted....is there ANYONE who doesn't get the gist of his story? I feel they are dealing with a topic that Smallville dealt with heavily and that is Clark feeling so alone and different. He wants to be able to use his abilities and not have to be afraid and feel like and outcast or unaccepted. Yup, the trailer renewed my faith, and choked me up a bit too! This trailer looks terrific and despite another origin story I think it's going to be great. It looks amazing. I'm SUPER excited to see this! *rimshot* Thanks folks, I'll be here all week. Only week? I need to sign you up for a long term engagement.